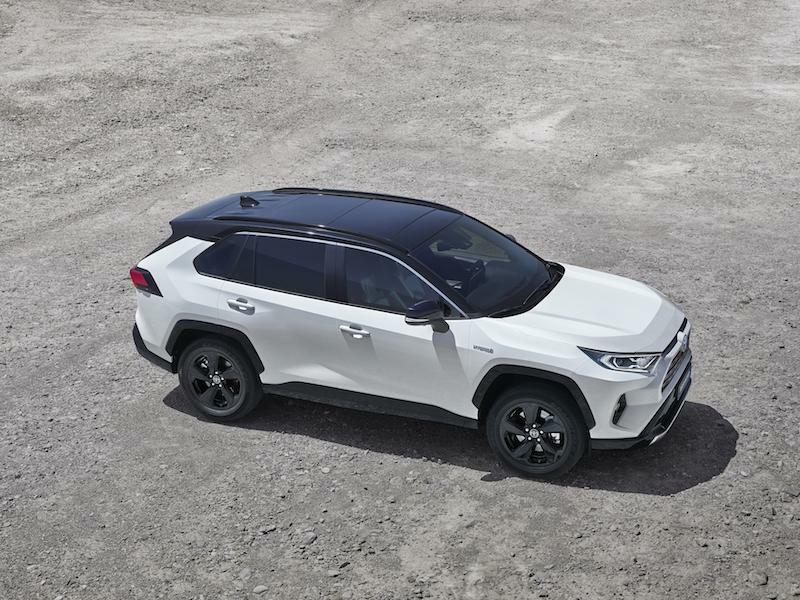 The same pioneering spirit is witnessed in the all-new fifth generation RAV4, which makes its first European appearance at the Paris Motor Show. This is a model which takes the SUV into a new era of performance, capability and safety, advances that are underpinned by the first use of a TNGA (Toyota New Global Architecture) platform in an SUV and a powerful new design. With its low centre of gravity and significantly increased body rigidity, the new RAV4’s GA-K platform directly contributes to superior handling, ride comfort, a spacious interior, class-leading load space and the freedom to produce a strong, eye-catching design with lower roof and bonnet lines and higher ground clearance. As well as providing more space and comfort, the cabin displays exceptional quality and finish throughout. The new RAV4 remains unique in its class in offering customers a self-charging hybrid electric powertrain – the choice of an overwhelming majority of customers in Western Europe (85 per cent in 2018). The new 2.5 litre, 219bhp TNGA hybrid powertrain will strengthen customer appeal, delivering step-changes in power, responsiveness and efficiency, with best-in-class fuel economy and emissions levels. At the same time, RAV4’s all-wheel drive systems have been comprehensively improved to achieve a “drive on any road” capability. 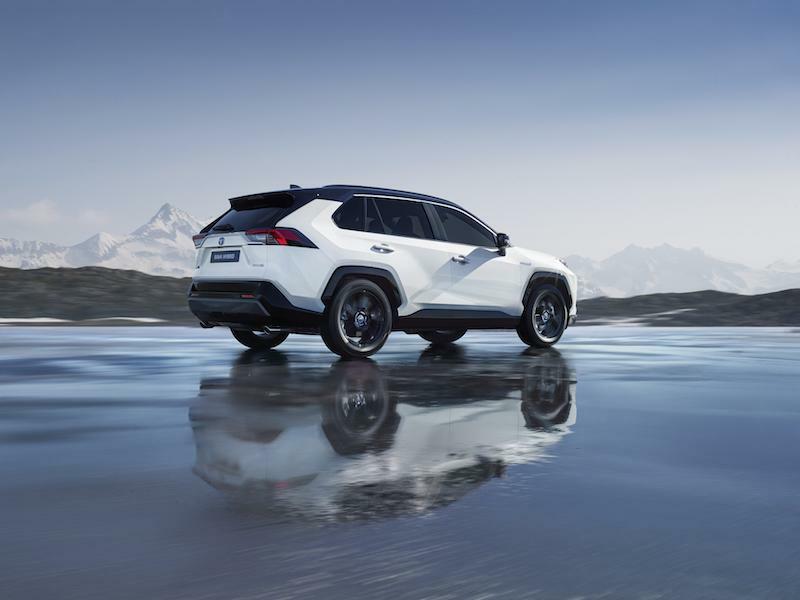 The new RAV4 Hybrid’s electric AWD system has been re-engineered and enhanced to provide a much stronger performance in challenging conditions and secure handling on slippery surfaces. The foundation of the new RAV4’s dynamic qualities is its all-new TNGA platform. This gives the car the core strengths of a low centre gravity, light weight and a strong, rigid and balanced chassis that delivers exceptional handling, stability and driver rewards. For the customer this makes the car more fun to drive, while at the same time enabling design freedom inside and out, enhanced safety performance that gives greater peace of mind and more comfort for everyone on board. The lowest possible centre of gravity is achieved by making every component lighter and locating it lower down in the vehicle – everything from the engine to the seats in the cabin. The platform also allows for a 57 per cent increase in body rigidity, which contributes to a stable, flat ride with superior handling. The TNGA platform underpins the “confident and natural” driving quality Toyota has sought for the new model: “confident” in not reacting adversely to disturbances and communicating a sense of stability, and “natural” in its intuitive, natural response to the driver’s inputs. Beyond the benefits of the chassis itself, further detailed measures make important contributions to its overall quality, with Toyota’s top engineers leading the development of the new RAV4’s dynamic performance, fine-tuning the handling and driveability. Response from the electric power steering has been improved by moving the assist motor from the column to the rack. The result is more linear increase in steering input torque and less strain on the steering shaft, which communicates a better, more direct feel to the driver as the steering loads up and gives more faithful line tracing through corners. Summer-specification tyres are used in place of the all-weather type, further adding to the precise driving quality and achieving top-class braking distances. The RAV4’s TNGA platform also distinguishes itself in its use of a double wishbone rear suspension system. Thanks to the low centre of gravity and high body rigidity, the suspension does not have to be rendered stiffer to meet dynamic targets. Nonetheless, precise adjustments have been made to the rear suspension to focus on better ride comfort, including a more upright setting for the shock absorbers and optimisation of the locating point for the trailing arms. The TNGA platform was of great benefit to Toyota’s designers in their mission to give the new RAV4 a strong SUV character and styling that sets it apart from other models in its segment. 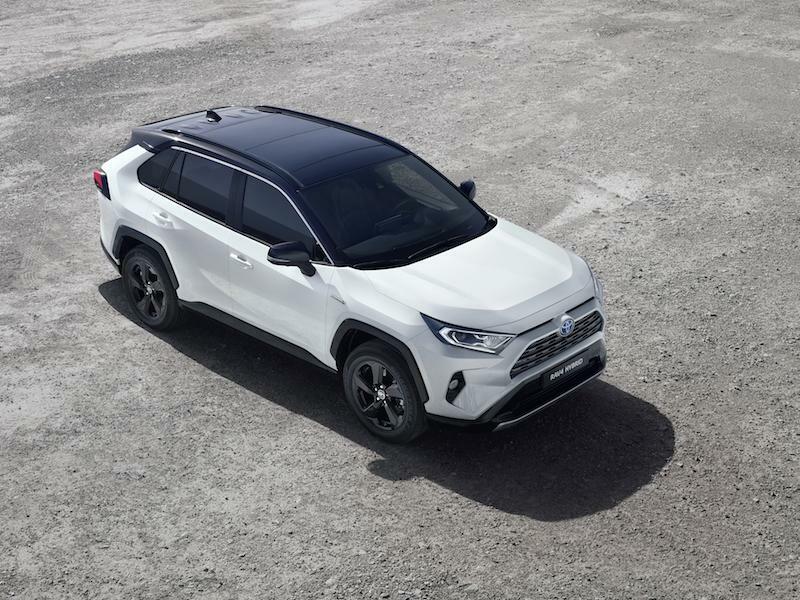 The powerful design combines with the unique new self-charging hybrid electric powertrain to give the new RAV4 the stand-out qualities required to attract customers in a highly competitive marketplace, in particular conquest sales to people new to the model and the Toyota brand. Key elements in generating this impact include raising the ground clearance (+15mm), using large diameter wheels and making the car suitable for multiple types of use. The exterior look is powerful and individual, with a solid form that extends from the front of the vehicle along the sides to the rear, giving the sense of a strong mass and authentic SUV capabilities. At the front the emphasis is on width and strength with extra volume added to the lower bumper section, and there is a similar effect at the rear where the horizontal line created by the tail lights and back window angles sharply downwards at each edge, drawing the eye towards the rear wheels and expressing the “polygon” influence on the design. The cabin is characterised by high sensory quality throughout and precision execution. Soft-touch surfaces abound, including the dashboard and door panels. Consistent patterns, textures, colours and ambient lighting are applied, with symmetrical shapes and use of the polygon motif seen in the Toyota FT-AC concept model. Switchgear is new, too, with cleanly integrated buttons and pleasingly tactile controls, such as the button/dial to adjust the air conditioning. Securing better all-round visibility was a key consideration in RAV4’s design process. The TNGA platform allows the bonnet to sit 15mm lower, adding two degrees to the driver’s forward field of vision, and the external mirrors have been moved to a lower position on the front doors. The front pillars have been made slimmer, the belt line has been lowered and the rearward view from the driver’s seat has been improved by enlarging the rear side windows and making a new digital rear-view mirror available (further details in the Equipment section). The driver’s comfort and sense of control when at the wheel are important considerations, and the new TNGA chassis allows for a more engaging driving position, without detracting from the commanding view of the road that’s a defining quality of SUVs. The driver’s hip point has been lowered by 15mm, but the range of steering wheel adjustment has been increased by 50 per cent. This, together with a generous seat adjustment range and precise positioning of the pedals and armrest, ensures more customers are able to find their ideal position when driving. Comfort for rear seat passengers has been improved with 40mm added to the left/right couple distance, more spacious rear footwells and two air vents. Increasing the opening angle of the rear doors and reducing the distance from the hip point to the rocker panel makes getting into and out of the vehicle and access to child seats easier. 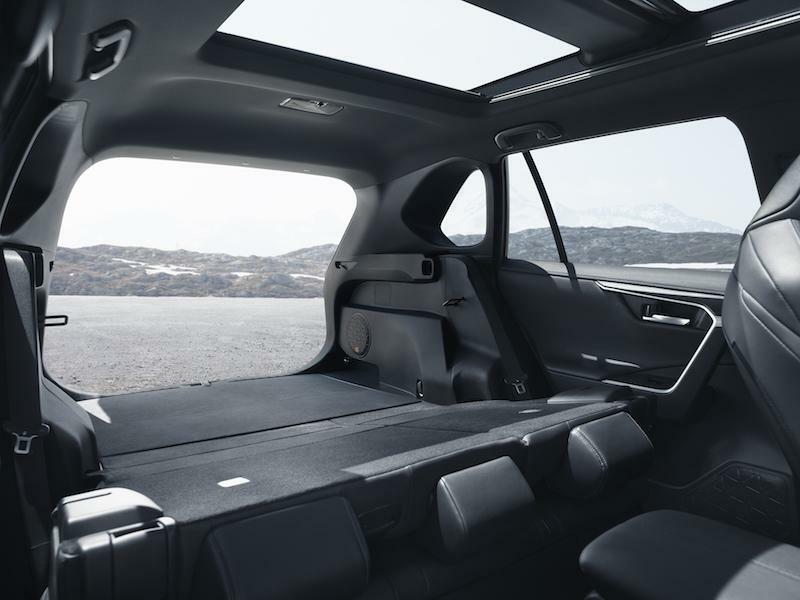 The load space behind the rear seats has been made larger and more user-friendly, notably thanks to a fully flat floor and a length extended by 60mm to secure best-in-class capacity, 79 litres more than in the current RAV4. Flexibility is designed-in so that the space can easily be adapted to gain more cargo room when required: with the rear seats folded down, the new RAV4 can accommodate a 29-inch mountain bike without any wheels having to be removed. The new RAV4 will be available with two TNGA powertrains, both more powerful and fuel-efficient than those in the current model. The new 2.5 litre RAV4 Hybrid combines fuel and emissions efficiency and quiet operation with more power and greater responsiveness. The full system maximum output of 219b hp/163 kW compares to 19bhp/45 kW for the current model, signalling how Toyota’s latest self-charging hybrid technology is not lacking in strength; acceleration from rest to 62mph takes just 8.1 seconds. 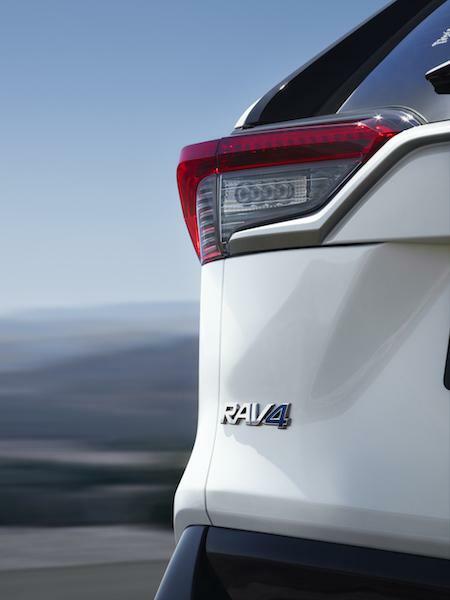 This proposal of “power with no compromise” gives the new RAV4 a unique advantage in its class and, with the benefit of its improved performance, driveability and efficiency, this powertrain option is expected to account for an even greater proportion of sales. Toyota predicts that this will rise from the current 85 per cent to 90 per cent for the new model in Western Europe. A new 2.0-litre petrol engine will also be available, with a choice of manual or automatic transmissions. Toyota’s fourth generation self-charging hybrid electric system makes its debut in the RAV4, bringing with it multiple benefits. Key components, including the power control unit (PCU) and the nickel metal-hydride Battery are more compact and lighter in weight, and have been engineered to reduce electrical and mechanical losses. 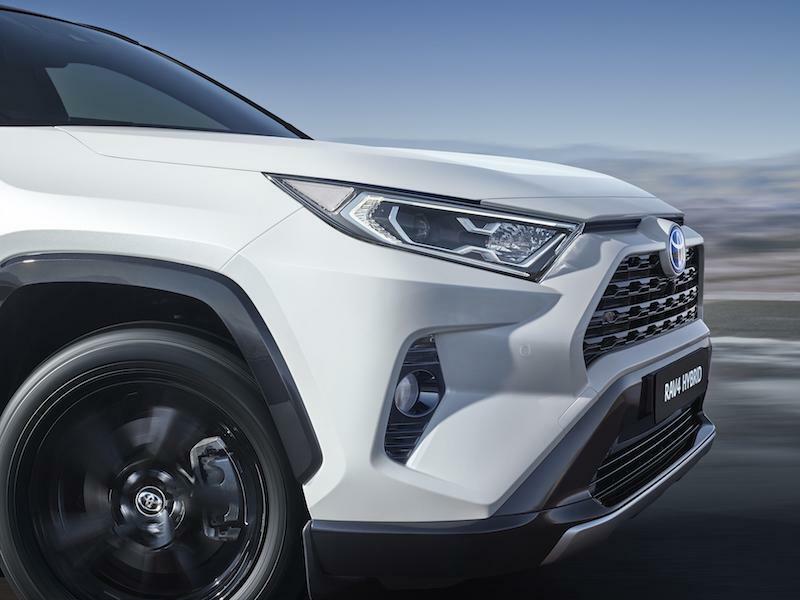 The powertrain makes use of Toyota’s new 2.5-litre Dynamic Force engine, a four-cylinder unit with direct and indirect injection that targets best-in-class fuel consumption and emissions for the new RAV4. Toyota expects combined cycle fuel economy to be 62.8mpg* (correlated NEDC) with CO2 emissions from as low as 102 g/km* (correlated NEDC). For the driver, the results are better acceleration from stationary, improved efficiency at higher speeds and overall smoother and more linear acceleration. Toyota is introducing improvements in the all-wheel drive technology in the new RAV4 to deliver enhanced performance, capabilities and control in all driving conditions, adding to the model’s “go anywhere” spirit and driving pleasure. Its impressive AWD performance on-road and off will further distinguish the new RAV4 among its competitors, with secure cornering performance and grip in all conditions. The system efficiently generates drive torque using power from the hybrid vehicle system and an additional motor generator on the rear axle. This design reduces energy losses, saves weight and optimises AWD operation in different driving conditions. Compared to the current model, the level of torque that can be directed to the rear wheels has been increased by 30 per cent, enabling a front/rear split from 100:0 to up to 20:80, depending on driving conditions. Maximum torque to the rear wheels has increased from 953 to 1,300Nm, matching or even bettering torque achieved by mechanical systems and giving more surefooted performance, for example when pulling away on loose, slippery surfaces. The electric AWD system automatically optimises this torque ratio according to driving conditions, providing improved handling, stability and off-road performance, particularly in faithful line tracing through bends in slippery conditions, giving the driver a strong feeling of all four wheels being in good contact with the road. The mechanical all-wheel drive system on the new RAV4 2.0-litre petrol CVT model is equipped with Toyota’s first dynamic torque vectoring system with Rear Driveline Disconnect. This manages torque distribution between the left and right rear wheels using twin couplings on the rear axle to give stable performance and accurate response to the driver’s steering inputs when cornering, both in dry and slippery conditions. The new RAV4’s AWD performance is further improved with the introduction of AWD Integrated Management (AIM), a unique feature in its class. 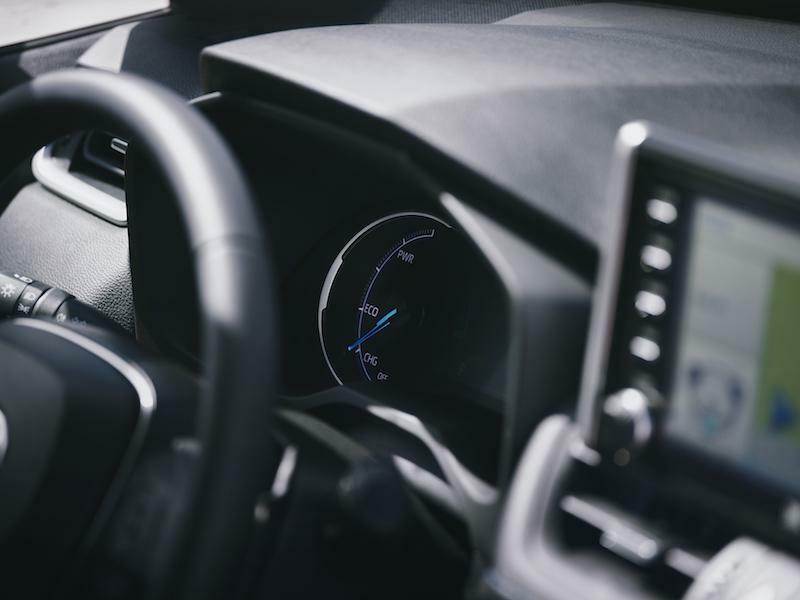 This automatically adjusts different vehicle systems – steering assist, brake and throttle control, shift pattern and drive torque distribution – according to the drive mode selected. 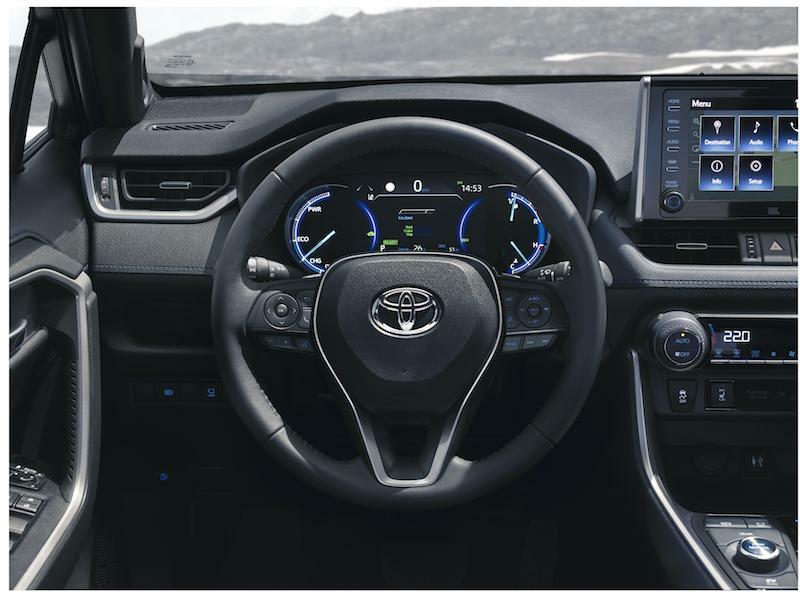 In the new RAV4 Hybrid, the driver can switch from Normal to Eco or Sport mode. When choosing Sport mode, AIM modifies the steering assist, throttle control shift schedule and drive torque distribution to gain better on-road performance. The RAV4 Hybrid gains a higher level of capability with the introduction of a new automatic limited-slip differential control – Trail Mode – which ensures the best possible grip and control in slippery conditions. It can also provide valuable assistance when tackling challenging off-road conditions. 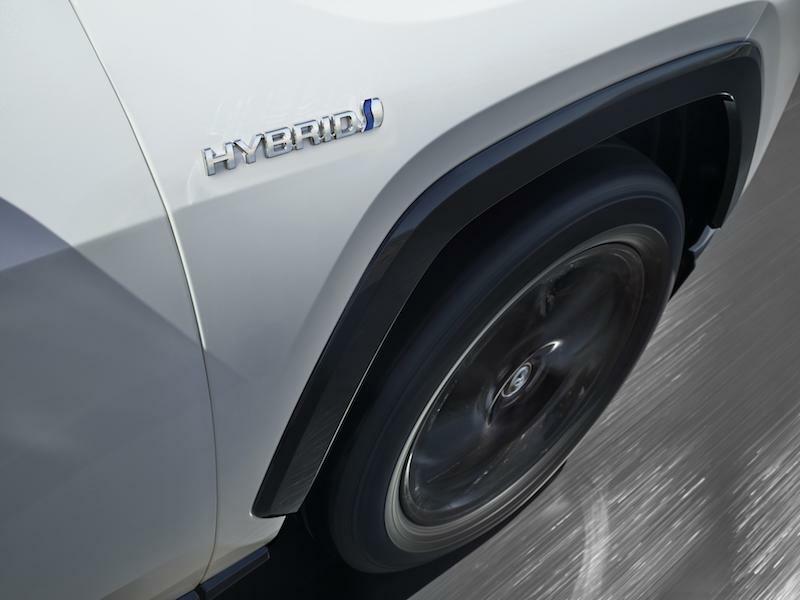 With the current generation RAV4 Hybrid, there is a risk of the vehicle becoming stranded if a driven wheel loses contact with the ground on very uneven terrain. On the new model, by activating the Trail Mode (via a Drive mode selector on the centre console), the free rotating wheel can be braked and drive torque directed to the grounded wheel. Throttle control and the transmission shift pattern are also adapted to help the driver keep the vehicle moving. 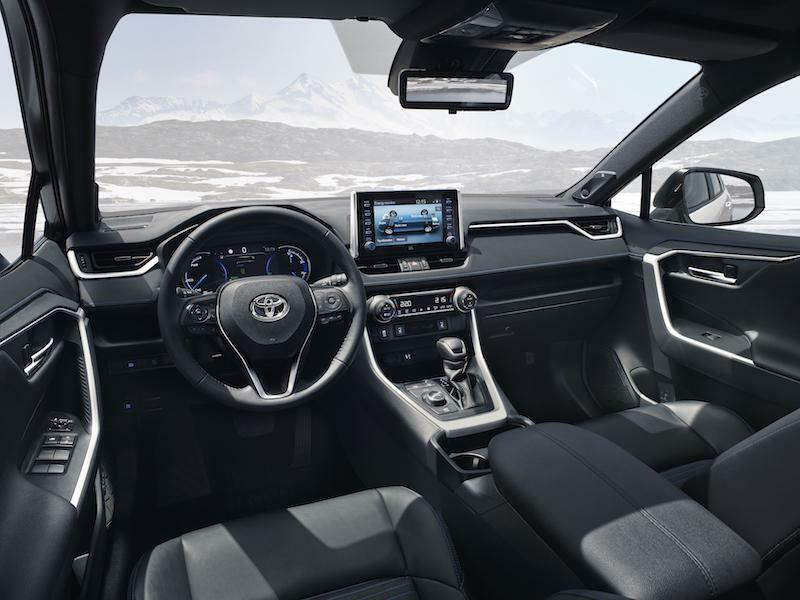 Equipment specifications for the new RAV4 will demonstrate how Toyota continues to apply technologies to deliver useful innovations in safety, technology, comfort and everyday practicality. Features that will be available as standard or as options, according to model grade, will include a power-operated panoramic roof, ventilated seats, wireless charging for smartphones and up to five USB ports around the cabin for the connection of multiple devices. The new RAV4 will offer generous equipment specifications across its range in Europe, with all models equipped as standard with the latest iteration of Toyota Safety Sense with an eCall emergency contact function. (Read more about Toyota Safety Sense in the dedicated chapter). Even at entry level, the check-list will include 17-inch alloy wheels, roof rails, LED headlights, push-button start, a seven-inch display audio and 4.2-inch TFT multi-information display. Features such as 18-inch alloys, smart entry, extensive soft touch cabin trims, larger display screens, leather upholstery, projector LED headlights, rear privacy glass and a power-operated tailgate will also be available. The Style grade will stand out with its bi-tone paint finish, striking a contrast between the bodywork colour (a choice of four) and a black roof section, plus projector LED headlights and black 18-inch alloys. 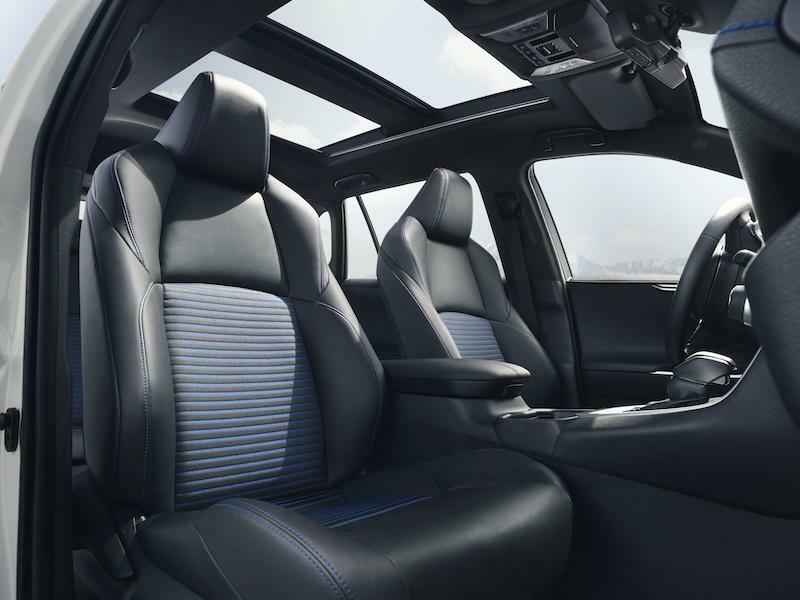 In the cabin sports-style seats, a black headlining and blue trim accents further emphasise the car’s distinctive quality. A wide range of option packs and accessories will be available so owners can equip their RAV4 to perfectly meet their lifestyle preferences. 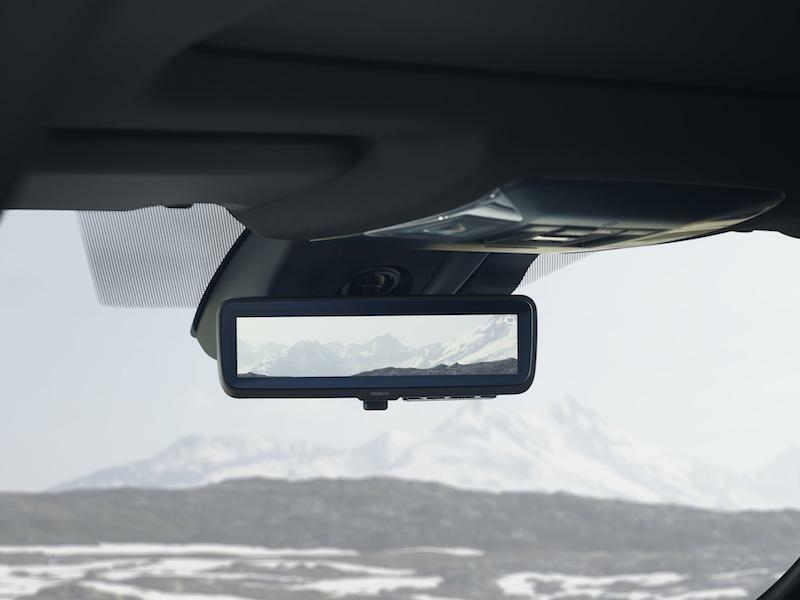 Further premium features which will be available on the new RAV4 include a Panoramic View Monitor, which provides the driver with a real-time 360-degree view of the area immediately around the vehicle, including a bird’s eye aspect from above. This is of value both off-road, to better negotiate tricky terrain, and when manoeuvring in confined spaces where hazards can lurk outside the driver’s line of sight. 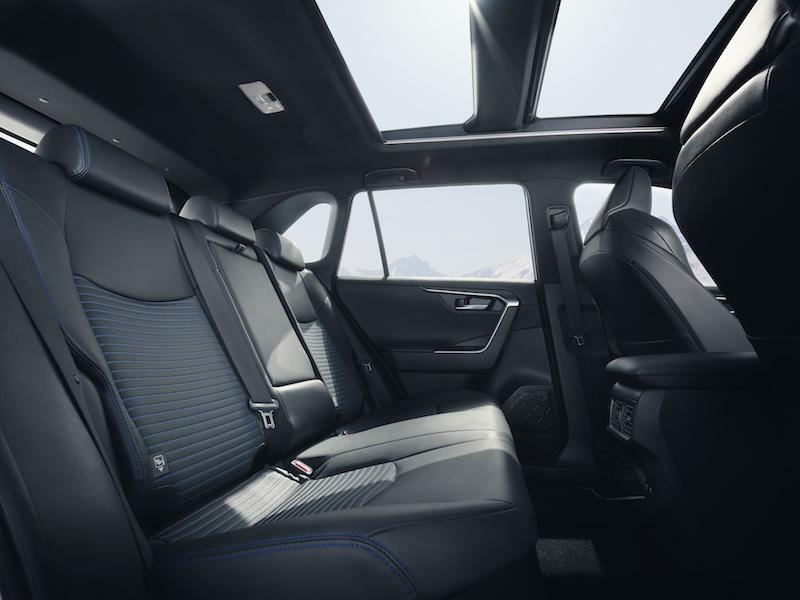 The open and spacious cabin environment can be further enhanced with an opening panoramic sunroof. Where on-board entertainment is concerned, Toyota has worked with premium audio partner JBL to deliver high-quality, immersive experience. The tailor-made new RAV4 JBL audio system will deliver concert sound quality through its nine-speaker architecture. It features JBL’s signature Horn Tweeters, a new, powerful subwoofer and an amplifier with Clari-FiTM digital music restoration technology. The Toyota RAV4 started out as a pioneer, niche model but has gone from strength to strength to become one of the world’s best-selling vehicles. It can be credited with creating a whole new market segment, one in which today every major manufacturer is represented. The model now sits at the heart of Toyota’s global business. Cumulative global sales across four generations since 1994 have reached more than 8.1 million, while in 2017 the current RAV4 was the world’s best-selling SUV and fourth best-selling model overall, with 810,953 sales. 1 Based on Regulation EC 2017/1153 as amended EC2017/1231 – pending final homologation. 1 Based on Regulation EC 2017/1153 as amended EC 2017/1231 – pending final homologation.